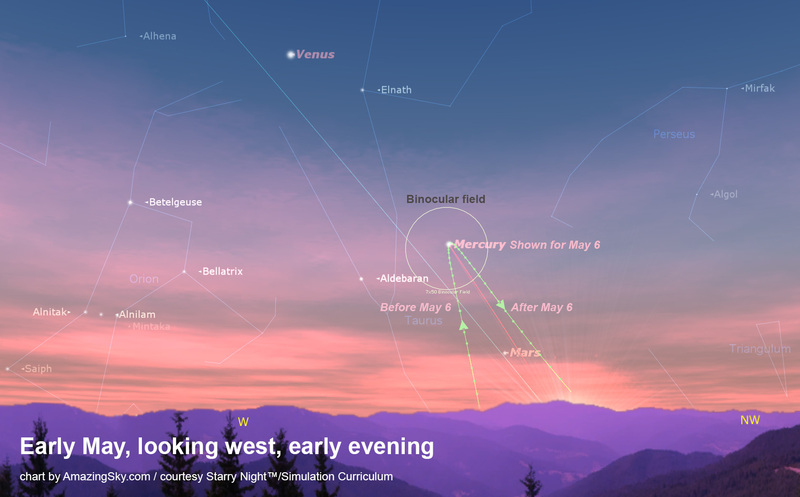 The next two weeks are the best in 2015 for sighting Mercury in the evening sky. Mercury is coming into view in our evening sky, climbing as high as it can get for us in the Northern Hemisphere. This is our best chance for us to sight Mercury as an evening star in 2015. Spring is always the best time to catch elusive Mercury. The angle of the ecliptic – the path of the planets – swings up highest above the horizon in spring, putting Mercury as high into the evening twilight as it can get. This makes it easier to sight Mercury than at other times of the year when, particularly for observers at northern latitudes, Mercury can be lost in the twilight glow and horizon haze. When it is at its highest Mercury is surprisingly bright, appearing as a bright star easily visible to the naked eye. However, locating it at first in the twilight usually requires a scan with binoculars. Mercury will be at its highest on May 6 when it reaches “greatest elongation.” However, it will be almost as good for a week on either side of that date. Mercury will be shining above fainter Mars, and well below brilliant Venus, now dominating our evening spring sky. Look north of due west during the hour after sunset. 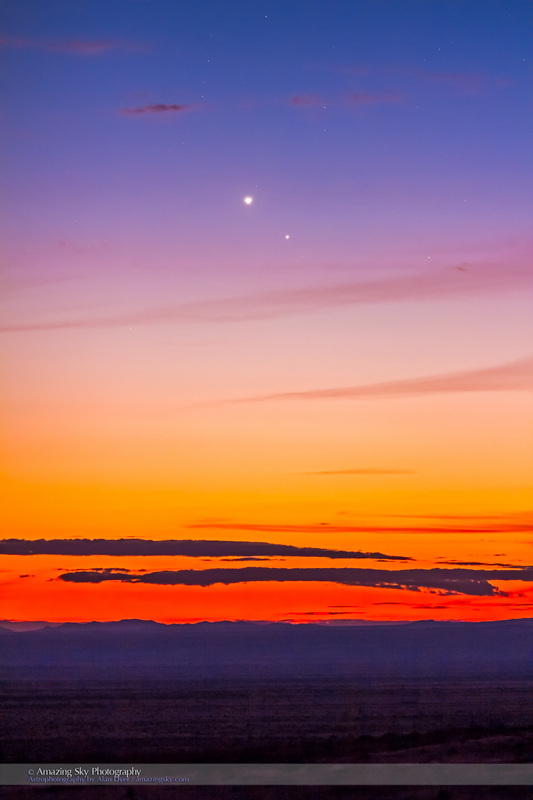 Mercury and Venus on January 10, 2015 from New Mexico. This view captures Mercury at its last good evening appearance, back in early January when it appeared close to Venus, then emerging into the evening sky. You can compare their relative brightness. By coincidence, the emergence of Mercury into our evening sky comes just as it loses its lone visitor from Earth. 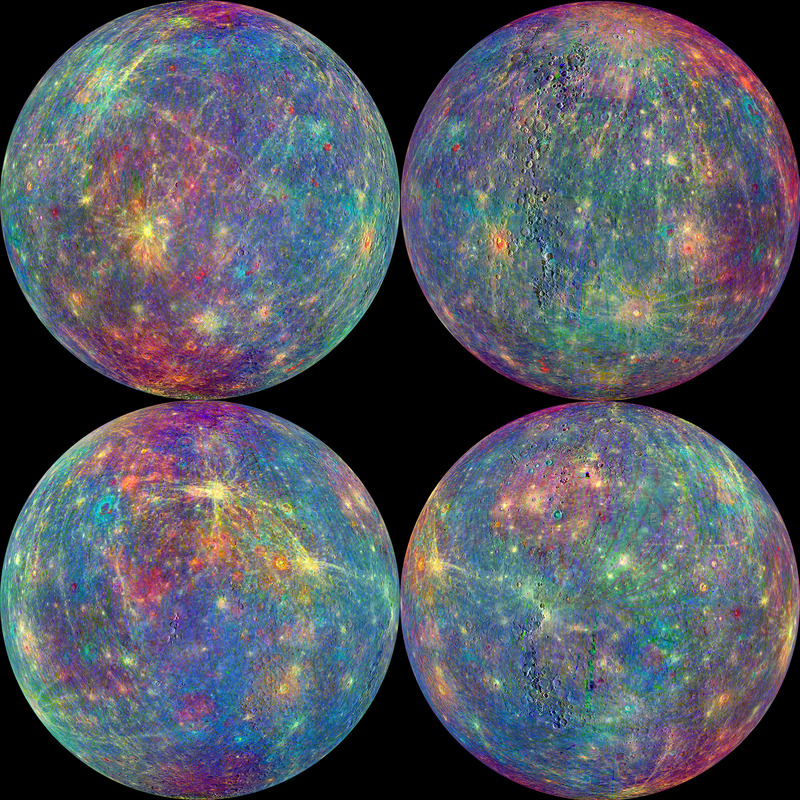 Since 2011, NASA’s Messenger probe has been orbiting and mapping Mercury. On April 29, with the probe exhausted of its maneuvering fuel, Messenger is scheduled to end its mission by crashing onto the planet, adding a new crater to Mercury’s barren and volcanic surface. A global false-color map of the mineral composition of Mercury from Messenger data. This is a recent map of Mercury from Messenger. For more details, see the mission’s website. 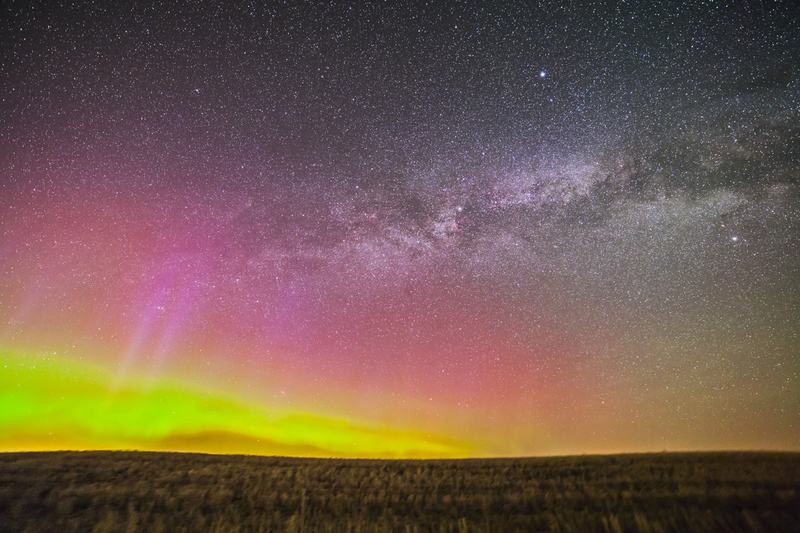 The Milky Way appears from behind the colourful curtains of the Northern Lights. 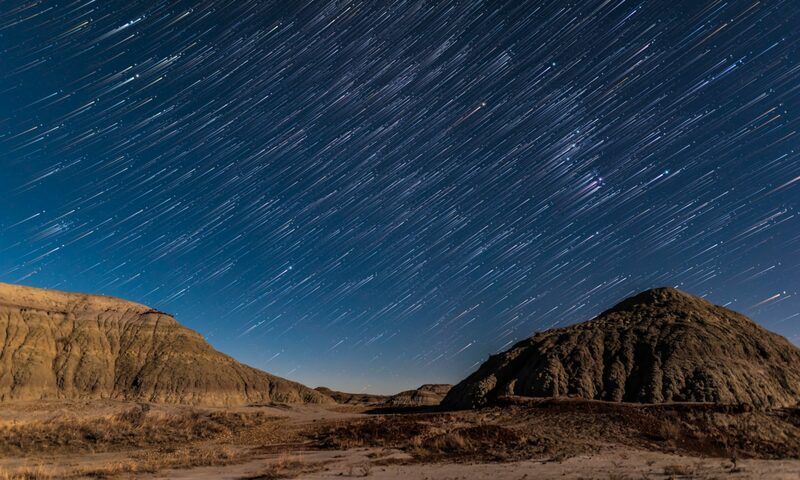 This was the scene last Saturday night, into the pre-dawn hours of Sunday morning, May 5, as the summer Milky Way rose in the east while a display of aurora played across the northern sky. The Northern Lights weren’t particularly bright this night, but the long 2-minute exposure I used to bring out the Milly Way recorded the aurora with colours and an intensity only the camera could see this night. The green is from oxygen glowing in the lower part of the atmosphere, though still some 80 km up, where only rockets and high-altitude balloons can fly. The tops of the auroral curtains are tinged with the pinks from another type of oxygen emission possible only at the very top of our atmosphere, where molecules are few and far between and what’s left of the air that surrounds us meets the vacuum of space some 150 km up. From Earth it’s hard to visualize just what we are seeing when we look at display like this. But check out some of the Aurora videos at NASA’s Gateway to Astronaut Photography of Earth. You’ll see time-lapse videos taken from the Space Station as it flies by and through the same types of aurorae with green lower bands and pink upper fringes, beautifully captured floating high above the Earth in vertical curtains reaching up into the blackness of space.